i.safe MOBILE is your partner for the development, certification and marketing of mobile communication devices to be used in potentially explosive hazardous areas. Our primary aim is to provide all of the necessary information and communication technologies required by modern mobile workspaces. Centered on an engineering team with more than 75 years of combined experience working in this demanding field, i.safe MOBILE has a clear focus on the development, production and sale of mobile communication equipment, resulting in market-driven and customer-oriented products. Rather than modifying existing devices, our engineers design our communication equipment from the ground up to be intrinsically safe, without any need to compromise quality, safety or functionality. Directly combining German engineering and quality with proven manufacturing without any large overheads results in short development times, low prices and the ability to customise products to a degree unparalleled anywhere on the market. The product spectrum ranges from basic mobile phones to dual-SIM e-mail-enabled workhorses, to top of the line Android™ smartphones, opening up a whole new set of applications in process automation and field maintenance. Building safe products is not enough for an industrial workspace. Our products are drop, impact, dust and water-resistant (up to IP86), and can withstand the harshest conditions of any industrial environment. Safety features, such as man down alert with dedicated buttons, GPS-locating pre-defined emergency call procedures and even more sophisticated lone worker protection, are included in all of our equipment. 3G, WiFi, push-to-talk, NFC functionality, high-resolution auto-focus cameras and push-e-mail, as well as contact and calendar synchronisation with computers or servers, ensure that all information you need to send or receive is available at your fingertips, anytime, anywhere. Certified to ATEX / IECEx Zone 1/21, the intrinsically safe ADVANTAGE 1.0 mobile phone is built to last. The phone is a very lightweight yet rugged, dust and water-resistant (IP67), intrinsically safe industrial mobile phone with 3G/UMTS technology. It is ideal for use in extremely harsh conditions and in explosive environments, since it also features lone worker protection. The phone can be synchronised with e-mail applications. The phone features external charging contacts, so with the optional desktop charger it can be charged like a walkie talkie without needing to open any IP protective cover. The IECEx Zone 1/21 and IP68 certified INNOVATION 2.0 is the world’s first intrinsically safe Android smartphone. Using the proven DNA of the INNOVATION 1.0, this new device is seriously tough. Dust, water and shock-resistant, it is designed for professional enterprise use. The INNOVATION 2.0 smartphone provides the user with immediate access to business applications, e-mail, internet and any other information required. No matter when or where, even in explosion hazardous areas Zone 1/21, the INNOVATION 2.0 is designed for use by industrial customers, who need access to their existing IT infrastructure to control processes, look up documentation or undertake field inspections and maintenance. The Android 4.2 operating system allows easy application development and the use of commercially available standard programmes. It provides companies with an easily integrated and cost-effective solution, reducing the total cost of ownership and delivering workforce optimisation. With the INNOVATION 2.0, it is possible to connect all users in the company, regardless of their area of work, to the existing IT infrastructure. With a 5MP camera that can read barcodes, NFC (near field communications), PTT (push-to-talk), GPS tracking and lone worker protection, the INNOVATION 2.0 replaces at least three devices in a very convenient IP68 ergonomic device. A broad range of accessories, including leather cases, belt clips, desktop chargers and ATEX / IECEx certified Bluetooth headsets, are also available. 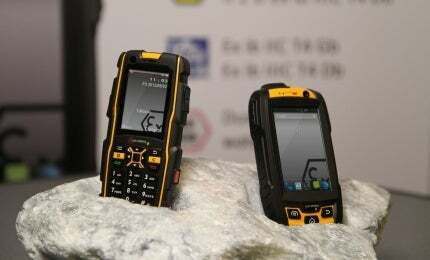 i.safe MOBILE has launched its latest Android smartphone for ATEX Zone 1/21. Under the motto "we have understood", the technology leader in the field of explosion-proof communication technology, i.safeMOBILE, has released a unit that meets all the requirements of a lone worker. Android™ 4.2.1 Platform: use all possibilities of modern smartphones in ex-hazardous areas.